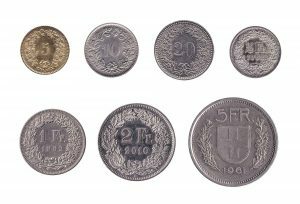 The Swiss Franc is the currency of Switzerland since 1850, replacing different currencies of the Swiss cantons. Besides the Swiss Confederation, the Principality of Liechtenstein also uses the Swiss Franc as its official currency. The currency code for the Swiss Franc is ‘CHF’, which stands for the Latin ‘Confoederatio Helvetica Franc’. The Swiss franc is identified as one of the safe haven currencies for 2017. We exchange both Swiss Franc coins and banknotes, and we also accept withdrawn Swiss Franc banknotes for exchange, including the demonetized 5th Series notes. Our online exchange service is quick, easy, secure and free of charge.